Anti-war Leaders Blast Escalation of Afghanistan War | Fight Back! Minneapolis, MN — At a packed press conference here Dec. 1, leaders of the Twin Cities peace movement responded to President Obama’s announcement that 30,000 more troops are being dispatched to Afghanistan. Representatives of a spectrum of peace groups came together to watch President Obama’s national televised speech and responded by demanding that U.S. troops get out of Afghanistan now. Representatives of Military Families Speak Out, Iraq Peace Action Coalition, Anti-War Committee, Twin Cities Peace Campaign-Focus on Iraq and Women Against Military Madness were among those planning to attend the press conference. 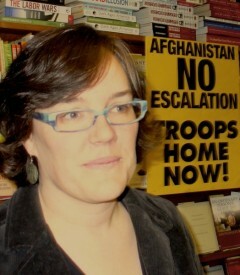 Across the U.S., protests are planned to demand an end to the U.S. war in Afghanistan.